THREAD aims to simplify every step from ePRO to Virtual Trials. THREAD's cloud-based suite of technologies are packed with powerfully simple features — and we'll be right by your side for as long as you need us. For remote patient research to become ubiquitous it must be made simple. THREAD aims to simplify every step between ePRO to Virtual Trials. ePRO shouldn't be so hard to add to your study. 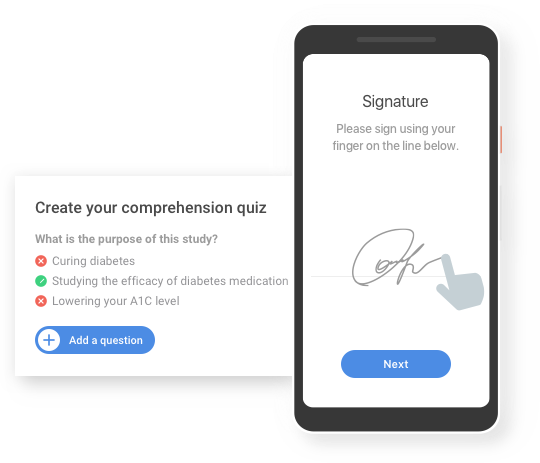 The THREAD ePRO library allows you to simply add validated and digitally licensed ePROs to your studies within each iOS and Android patient-facing app. THREAD has pre-built integrations with over 300 wearables, medical devices and health apps for use in research studies. Simply navigate to your desired device, learn more about it and check the box to add it to your study. Benefit from continual access to study data. Extract key insights and observe study performance in real time. THREAD can also fully integrate into existing data systems to meet your data transfer requirements.